"It was the day he finally said good-bye to Fiji Ports Corporation Limited – a place he has called home for the past 32 years." by source: fiji ports corporation limited. January 31, 2019 would be forever carved in the memory of 58-year-old Marika Koroi. 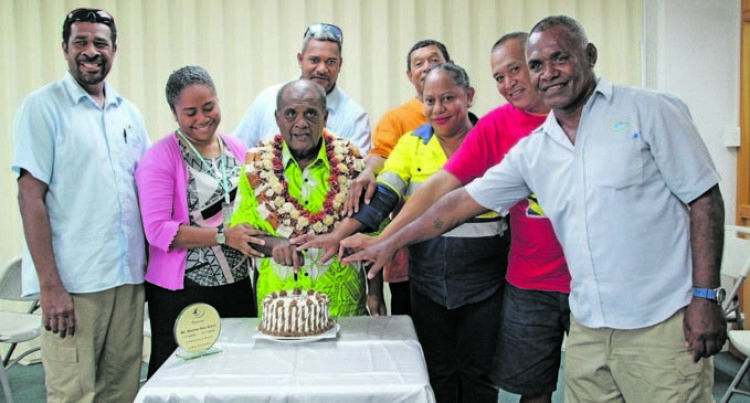 It was the day he finally said good-bye to Fiji Ports Corporation Limited – a place he has called home for the past 32 years. Originally from Lamiti, Gau in Lomaiviti, Marika’s decision to leave “home” was not an easy one. Even though the retirement age for Fiji Ports is set at 60 years, his unfavourable health has led to his early retirement. He was one of the few remaining longest serving employees for the organisation witnessing the transitions over the years to what it has become today. Best described as a humble, hardworking and committed worker, he worked his way up the ladder, retiring as the Supervisor Local Wharf (LW). He also worked as a Stevedore, Billing Officer and was also part of the Port Security Unit. As the head of the Local Wharf family, Marika will be sorely missed by his members because of his good leadership and guidance. Speaking on behalf of the Local Wharf department in an emotional farewell, LW Coordinator Sera Ieli said Marika was more than a friend, less of a colleague, more of a leader and less of a boss. “Some bosses give orders, you gave us direction, some give targets, you gave us a vision, the others lead by authority, you have always led us by respect, we will surely miss your kind smiles,” Ms Ieli said. She said Mr Kori hardly got angry and it was something they were grateful for and he spoke to them gently with a loving tone always. An emotional Mr Koroi thanked the company for the memorable years of services and acknowledged other veteran workers who are still part of the company. “It’s really hard for me to be farewelled today,” Mr Koroi said. “To all my brothers and sisters, I am surely going to miss you,” he said. Chief executive officer Vajira Piyasena commended Marika for his contributions throughout his years of services. “Throughout your years of work at FPCL, the company has enjoyed the fruits of your exemplary work,” Mr Piyasena said. “Although we hate to see you go, we are happy to see you rest from the stresses of the daily working life and now move to a peaceful and blissful lifestyle you fully deserve, we wish you all the best,” he said. As the Local Wharf Supervisor, Marika was responsible for over-seeing the Operations at Port Mua-i-Walu 1 that looks after locally registered fishing vessels and Port Mua-i-Walu 2 that facilitates inter-island vessels.